The long-awaited upgrade of the most popular EV to date is finally here. The US has been the world’s largest LEAF market, with more than 113,000 sold. Globally, the Nissan LEAF is also the world’s best-selling EV, with over 281,000 units sold and more than 1.8 billion miles traveled on electric power. The new version of the LEAF, with improved styling, better range, and advanced driver assistance features, is expected to be a competitive electric vehicle in 2018. Some fans may miss the goofy looking headlights, though! The LEAF will adapt the Tesla strategy of different size batteries at different price points. The 2018 LEAF offers a 40 kWh battery now, with an EPA-estimated range of 150 miles. The 2019 model will offer the option of a 60 kWh battery for greater range. That range will have to be more than 200 miles, if the LEAF is to compete with the Bolt and Tesla Model 3. Charging time with the standard 6 kW charger takes 8 hours, while the fast charging setup will give you an 80 percent charge in just 40 minutes. A Level 2 charging cord is standard on the top-of-the-line SL trim level, and optional on the S and SV trims. LEAF will be available with technology called ProPilot, a level 2 autonomous system already in some LEAFs in Japan. ProPILOT is an semi-autonomous drive technology designed for highway use in single-lane traffic. It introduces a combination of steering, accelerator and braking that can be operated in full automatic mode, easing driver workload in heavy highway traffic and long commutes. Employing image-processing technology, the car’s ProPILOT system understands road and traffic situations and executes precise steering enabling the vehicle to perform naturally. ProPILOT technology is user-friendly, thanks to a switch on the steering wheel that allows the driver to activate and deactivate the system. ProPILOT’s interface includes a personal display showing the operating status. The accelerator, brakes and steering are controlled based on information obtained through a camera equipped with advanced-image processing software. The ProPILOT camera can quickly recognize, in three-dimensional depth, both other vehicles and lane markers. The new LEAF incorporates the new Vmotion design language, featuring boomerang-shaped headlights and taillights, plus the “floating roof” design at the C pillar that is also found in other Nissan models like the Maxima and Murano. Nissan Intelligent Mobility is represented by the core tenets of connectivity, electrification and self-driving capability. The 2018 LEAF comes standard with these features. Many LEAF owners have complained about the availability of charging infrastructure in the USA. There do not seem to be enough working, fast chargers available to them when they need to exceed the range of their batteries. The LEAF’s use of the Japanese CHAdeMO charging standard is also not the best choice for the United States, as there is not an abundance of this type of charger. The CCS quick-charging standard is being adopted by most electric vehicle makers, and is the type of charger showing rapid growth throughout the country. Home Charger (240V, 30+ amp service) Installation Cost: EV charging stations average $300-$600; Electrician labor cost is approx. $400. The 2018 Nissan LEAF made its North American debut on September 5, 2017. In the seven years that the original LEAF was on the market, it has sold more than 110,000 units in the US, and 281,000 worldwide. It is by far the world’s best-selling electric car, and has showed the world that an electric car can be a practical option – if you can fit it into your lifestyle. Much has happened on the electric car scene since the first LEAF appeared in 2011 model year. Ford, Volkswagen, Hyundai, Kia, Fiat, and now Honda are selling electric cars, in at least parts of the US market. The new Chevrolet Bolt has shattered previous range expectations in the popular-priced electric segment with its groundbreaking 238-mile range. The mania over the $35,000 base-priced Tesla Model 3 has reached an even higher pitch with the recent release of thirty early production cars to their Tesla employee owners. No one has been talking about the LEAF for quite some time. So can the redesigned 2018 LEAF steal back the spotlight that it has lost to newer, higher performing, and sexier electric car entries? Nissan’s next generation of the LEAF will certainly try to go where no low-priced electric car has gone before! Let’s see how it stacks up. The 2018 Nissan LEAF has abandoned its quirky, look-at-me-I’m-an-electric-car appearance to blend in with its Nissan stablemates. Still built on a version of the LEAF’s original platform, it retains the same five-door hatchback layout and the same wheelbase. There are slight increases in length and width, and it is a little lower. You can still see a bit of the old LEAF in the rear door and window design. The new 2018 LEAF now proudly wears the corporate Nissan V-Motion front end styling. In place of a mesh grille, the LEAF wears a solid clear blue front panel, since no combustion engine cooling is necessary. It also features the “floating roof” elements and boomerang lighting design that you can see on many other Nissan products. New two-tone paint treatments lighten the LEAF’s look and provide a more modern appearance. Aerodynamics have also been improved, with a roof spoiler integrated into the rear window graphic element. Combined with the 2018 LEAF’s underfloor design, aero-design wheels, and diffuser-type rear bumper, improved vehicle stability is the result. The new Nissan LEAF has a low 0.28 coefficient of drag. The new 2018 LEAF features a totally redesigned cabin that is focused on the driver, combining excellent space utilization with functionality. Stitching in an intense shade of blue is used on the seats, instrument panel and steering wheel, denoting that this is a Nissan electric vehicle. Blue is the new green! The 7” full-color TFT display has been redesigned, allowing for easier understanding of the Safety Shield technology, power gauge and audio and navigation system information. Apple CarPlay and Android Auto are also included. The 2018 LEAF packs an upgraded electric motor with an output of 147 horsepower, a 38 percent increase over the previous model’s 107 horsepower. Torque is boosted to 247 lb.-ft., which is a 26 percent increase. Greatly improved acceleration is the result. The new LEAF’s battery range has also been improved. Its new 40kWh lithium-ion battery has 67 percent more energy density without an increase in size. Revised chemistry provides better battery durability through years of charging cycles. Estimated range is now 150 miles, which is a definite improvement, but still puts the LEAF in that group of second-tier electrics that have 120-150 mile ranges. The LEAF joins the BMW i3, VW e-Golf, and Hyundai Ioniq Electric in the minor leagues of range. The current superstars are the 238-mile Bolt and the soon-to-arrive 220-mile Tesla 3, which also offers an optional 310-mile battery pack. Nissan has promised a more powerful, longer-range 60 kWh version of the LEAF for the 2019 model year. Range will likely be around 250 miles, based on the EPA standard. Nissan obviously knows what they have to do to compete! A more luxurious version is also coming later. The 2018 LEAF’s electric charging setup is not ideal. It continues to use the CHAdeMO charging standard, which is most common in Japan and not found widely in the US. There is no provision for the CCS quick-charge standard, which is rapidly gaining adoption worldwide. On the plus side, the combination L1 + L2 charging cord (standard on SL, optional on S and SV) allows Level 2 charging from an existing 220V outlet, without the need for a dedicated charging unit. ProPILOT Assist, available on SV and SL models, provides automated driving features. When activated, the 2018 LEAF can drive itself in both single-lane highway trips and in stop-and-go traffic. ProPILOT Assist can automatically control the distance to the vehicle in front, using a speed preset by the driver. The speed can be set between 18 mph and 62 mph. It also helps the driver steer and keep the vehicle in the center of its lane. If the car ahead stops, ProPILOT Assist can apply the brakes to bring the vehicle to a full stop if necessary. There is also a new push-button self-parking function, which will appear here on the 2019 LEAF. ProPilot Park can park the LEAF in parallel, angled, front-in and straight back-in spots by taking over the accelerator, braking and steering. The e-Pedal is standard equipment on all 2018 LEAF models. It lets the driver accelerate, decelerate and stop the car by using the accelerator pedal alone. The objective is to reduce the amount of times that the driver must move his or her foot from gas to brake and back while driving in traffic, reducing driver fatigue. While the brake pedal must still be used for aggressive braking situations, the e-Pedal can be used for 90 percent of your normal driving needs. This feature uses a combination of motor braking and friction braking. The Nissan Safety Shield on the new LEAF includes a set of advanced safety technologies. These include: Intelligent Lane Intervention, Lane Departure Warning, Intelligent Emergency Braking, Blind Spot Warning, Rear Cross Traffic Alert and Intelligent Around View Monitor with moving object detection. The Nissan LEAF smartphone app has been redesigned. It now allows users to monitor the vehicle’s state of charge, schedule charging to benefit from lower energy prices, find nearby charging stations, and pre-heat or cool the vehicle before getting in. 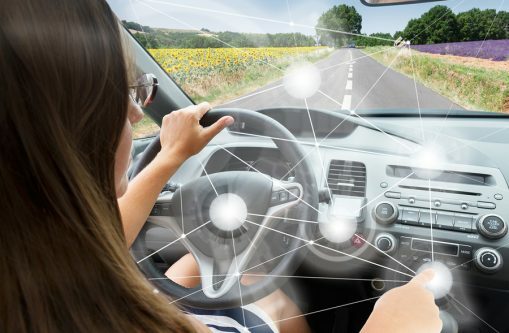 It also features advanced vehicle-to-infrastructure technologies that enable the car to connect to the power grid, where this is possible. The 2018 Nissan is available in three models: S, SV, and SL. The LEAF S starts at $29,990 in the US, before incentives and subsidies. This is lower than the 2017 model’s outgoing base price of $30,680, and includes e-Pedal and automatic emergency braking as standard equipment. The 2018 LEAF SV starts at $32,490 and adds intelligent cruise control, Apple CarPlay and Android Auto. The top-of-the-line LEAF SL starts at $36,200 and includes additional standard features: a Bose premium audio system, blind spot warning, rear cross traffic alert, intelligent around view monitor, and a portable L1/L2 charging cord. The ProPILOT semi-autonomous system is included in the available Technology Package, which is a $2,200 option on the SV and $650 additional on the SL. What Are The LEAF’s Prospects In Today’s Electric Car Market? The 2018 Nissan LEAF is a worthy successor to the original, but it enters the marketplace with a major range disadvantage. It gives up 70 miles to the upcoming Tesla Model 3, and is 88 miles behind the Chevrolet Bolt, which is currently available in all 50 states. The LEAF’s charging system is neither the fastest nor the best type for US drivers. The 2018 LEAF can boast a track record of 281,000 sold, and seven years of electric-powered driving on the roads of the world. LEAF also undercuts both Model 3 and Bolt on price, which may influence buyers for whom the LEAF’s 150-mile range is perfectly adequate. As usual, the market will decide how well the 2018 Nissan LEAF and its competitors will sell. With low gas prices and Americans’ insatiable appetite for trucks and SUVs, the new 2018 LEAF will find success to be a challenge in this market. The new Nissan LEAF goes on sale in Japan on Oct. 2, 2017. U.S. deliveries begin in early 2018. The 2018 LEAF for the US will be produced at Nissan’s Smyrna, Tennessee plant. Nissan’s plants in Yokosuka, Japan and Sunderland, UK will produce the new LEAF for other markets around the world. Minimum ground clearance 5.9 in. Cargo area 23.6 cu. ft. Please read our previously published Nissan Electric Cars review for a comparison with a previous model and read our published Electric Car reviews. The 2018 Nissan LEAF goes on sale in early 2018 at LEAF Certified Nissan dealers throughout the United States. The Tesla Model 3 has had its first 30 deliveries to employee owners, with the rest of its huge order bank being filled starting in late 2017, most likely with some delays. The LEAF is definitely not as exciting as the Tesla Model 3, but with an improved range, affordable pricing, and prompt availability, it will certainly be a contender. Read our Tesla Model 3 review for more info. Nissan adds push-button automatic-parking to next LEAF, reports AutomotiveNews. This feature will allow the LEAF to self-park in parallel, angled, front-in and straight back-in spots by automatically taking over the accelerator, braking and steering, Nissan said. The addition of self-parking "liberates drivers from one of the most tedious, and at times the most challenging, tasks of driving" and gives you confidence to "park perfectly." You get total confidence that even parking in the tightest space is completely automated and stress free. This feature will first be available on the 2019 LEAF in the US market. Nissan's ProPilot autonomous driving assistance technology explained. ProPILOT will be introduced into other vehicles, including the Qashqai in Europe in 2017. There are also plans for the technology to be introduced in the U.S. and China markets. Nissan reveals it’s new LEAF 2018 – Nissan’s next chapter in it’s endeavor to increase it’s share in the EV market. 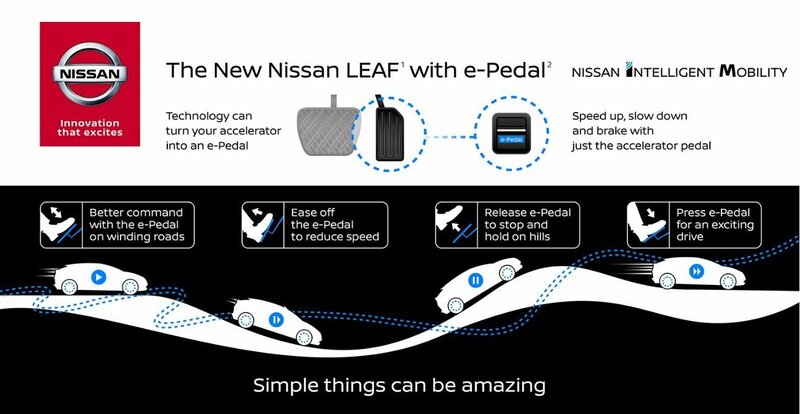 Nissan next-gen Leaf has ‘e-Pedal’ feature for one-pedal driving with regenerative braking.